This year, Massachusetts General Hospital reaches a remarkable milestone—our 200th birthday. When the Massachusetts legislature voted on Feb. 25, 1811, to create the third hospital in the young nation, the goal was to offer a place where patients, particularly the poor and vulnerable, could receive care. Proudly, this hospital has gone on to play a crucial role in pushing medicine forward, just one example being its public demonstration of the effectiveness of ether as an anesthetic in 1846. 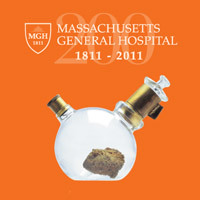 Inhaler for ether, first used at MGH in 1846. Proto has been published for just five of those 200 years, reporting on breakthroughs in medicine wherever in the world they may occur. In this issue, for example, we explore the complexities of tuberous sclerosis complex, assess promising approaches to melanoma treatment, consider the pros and cons of statins, and examine the role of metabolomics in unraveling disease. These stories represent innovation in 2011. By contrast, in 1811, medicine had limited tools at its disposal. Yet there was already a steady flow of new knowledge and visionary thinking. If Proto had been around 200 years ago, we might have run a Q&A with Benjamin Waterhouse, a Harvard Medical School professor intrigued by the work of Edward Jenner, the English physician who had discovered that inoculation with cowpox could prevent the more deadly smallpox. Waterhouse tested Jenner’s vaccine on his sons and several servants before challenging the Boston Health Department to promote widespread vaccination. The infographic, meanwhile, might have examined substances with potential medical implications, including newly identified sodium and potassium (1807), calcium and barium (1808) and iodine (1811). Our 1811 Proto might also have described the work of Scottish physician Alexander Hamilton, who in 1809 purportedly led a clinical trial involving 366 stricken soldiers, some of whom underwent bloodletting and some of whom did not. He calculated a mortality rate of 29% for those who were bled and 2% for those who weren’t. Other topics might have been the 1811 congressional act that paved the way for naval hospitals; the use of tobacco smoke enemas to treat gut pain, hernia, constipation and cholera; and the art and science of phrenology, the study of the shape and size of the cranium as a gauge of mental and moral qualities. Finally, our Post-Op essay might have been a chilling first-person account of amputation in the preanesthetic era. Today, as we shudder at the thought of tobacco smoke enemas or bloodletting, we also recognize that the most breathtaking innovations of 2011 will likely seem primitive in another 200 years. The topics that speak to innovation will always change, just as the drive to innovate is sure to endure.